QuickBooks makes it easy to create professional estimates and quotes. Create estimates on your phone. Seal the deal on the spot. Many small business owners provide a quote or estimate to a prospective customer before starting a job. With QuickBooks, it’s easy to create professional estimates that can include discounts, product SKUs, payment terms, and other line items. Your customer can accept and sign the estimate directly on your phone, and you can instantly email a copy. Create personalized, professional estimates that reflect your business and your brand. 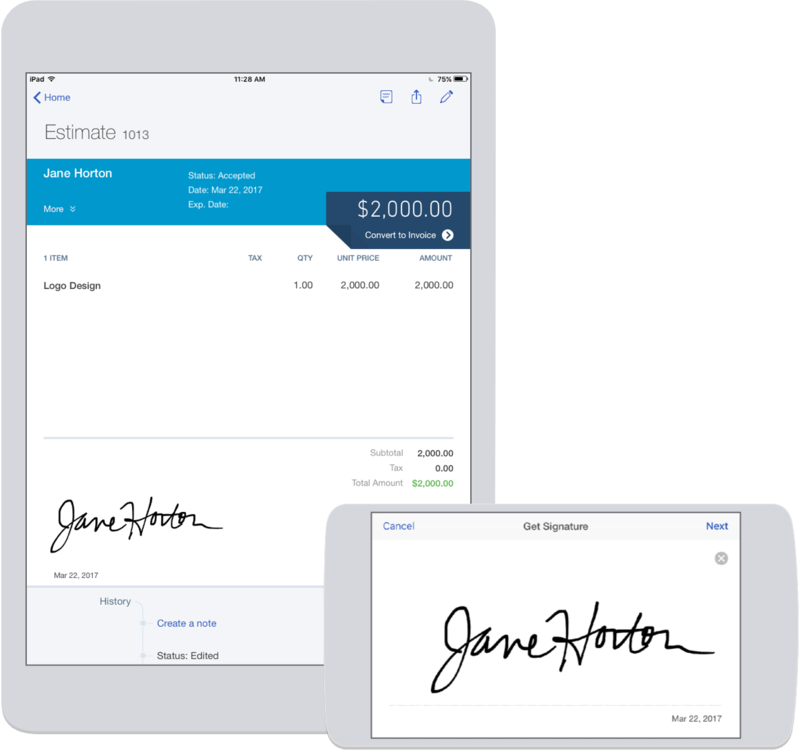 QuickBooks comes with a fully-customizable estimate template, making it easy to create a new estimate in minutes. Adjust the estimate layout, add your logo, include a personal message, and more. You can even add custom fields for tracking and reporting. Once a new estimate is accepted, QuickBooks will convert the estimate to invoices for you. Some businesses may choose to take a deposit at the beginning of the job and invoice for the remaining amount at the end. Others may choose to invoice incrementally throughout the job. However you choose to invoice, QuickBooks keeps track of everything for you. With QuickBooks, you can include a ‘Pay Now’ button on invoices so that your customer can choose to pay via credit card, debit card, free bank transfer, Apple Pay, or other payment service. QuickBooks processes the payment, tracks the transaction, and transfers the funds to your bank account for you. QuickBooks has a progress invoicing feature that makes it easy divide an estimate into multiple invoices based on project milestones, stages, or the percentage of work complete. When you bill incrementally and accept payments throughout the course of the job, QuickBooks automatically tracks what’s been paid and what is outstanding from the original job estimate. QuickBooks makes it easy to keep tabs on the status of your estimates so that nothing slips through the cracks. If you have a client that has more than one location, or if you are working on multiple projects for a single client, you can create estimates, send invoices, and view reports separately for each. More than just estimates. Run your entire business with QuickBooks. Snap photos of receipts and tag them to a particular job or project to accurately track your business expenses. With QuickBooks, your data syncs instantly across your phone, tablet, and computer so that your records are always up-to-date. We’ve done the math for you on thousands of state, city, and county sales tax rates around the United States, making it easy to manage sales tax. When you add sales tax to an invoice, the calculations and tracking are done automatically for you. QuickBooks includes the reports you need to run your business. Quickly access job profitability reports and job cost statements so that you know where you stand on each project. There are over 50 reporting templates in QuickBooks that give you insight into your whole business. Watch this video to see how to create estimates and quotes with QuickBooks. A good pricing strategy helps you determine the price point at which you can maximize profits on sales of your products or services. Review six common strategies that businesses implement when setting prices on their products and services. Many businesses run into trouble when they don’t plan correctly for a project’s expenses and required cash flow. Use these tips to leverage progress invoicing for successfully completing a large project. If you’re having trouble getting invoices paid by your customers, you’re not alone. Read a few ways to make sure you get paid as quickly as possible for your hard work. How do you create an estimate in QuickBooks? It’s easy to create an estimate in QuickBooks. First, click on the + at the top of the screen and choose ‘Estimate’ from the drop-down menu. You will be on the Estimate page where you can enter customer details and information about the product or service you will provide. From here, you can also choose to email the estimate directly to your customer for her records. Watch this quick video to see the steps in creating an estimate in QuickBooks.